Perhaps Julius Caesar and Cleopatra sipped chamomile tea to soothe their stomachs and promote sounder sleep. It wouldn't be surprising, since ancient Romans and Egyptians both lauded the curative properties of this daisy-like flower. Modern science has supported some of chamomile's traditional therapeutic uses. However, chamomile tea can have potentially negative side effects, so check with your doctor before using it to treat any health issues. Chamomile has two common varieties -- Roman and German. Most U.S. chamomile tea is prepared by drying the blossoms of the German variety. Chamomile tea is naturally caffeine free. According to the USDA National Nutrient Database for Standard Reference, 1 cup of brewed chamomile tea contains about 2 calories and .5 g carbohydrates. It also contains small amounts of calcium, magnesium, potassium, fluoride, folate and vitamin A, plus traces of several other nutrients. Chamomile tea contains substances called flavonoids, says a report published in the July 2006 issue of "Phytotherapy Research." Researchers believe that regular ingestion of plants like chamomile that have high concentrations of flavonoids can potentially enhance human health. Chamomile possesses anti-microbial and antioxidant properties, also possibly reducing inflammation and lowering both cholesterol and cancer risk. A study in the September 2008 "Journal of Agriculture and Food Chemistry" found that chamomile tea also helps regulate diabetes. 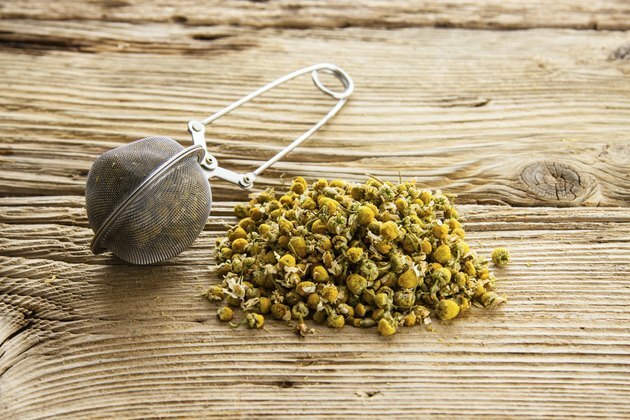 Americans most commonly reach for chamomile tea to counteract anxiety and as a sleep aid, says the University of Maryland Medical Center, or UMMC. Animal studies have confirmed its efficacy in these applications, but few human studies have been conducted. Other traditional uses include treating inflammation, muscle spasms, mouth problems and gastrointestinal issues. UMMC suggests a dose of 2 to 3 heaping tbsp. of dried flower heads steeped in 8 oz. of boiling water for 10 to 15 minutes, taken three to four times daily between meals. People allergic to flowers like chrysanthemums, daisies, marigolds, asters and ragweed should avoid drinking chamomile tea, says the National Center for Complementary and Alternative Medicine, since it can trigger an allergic reaction. Asthmatics also should not ingest chamomile tea, as it has the potential to worsen symptoms, says UMMC. UMMC also recommends that pregnant women shouldn't drink chamomile tea, citing a potential for miscarriage. Highly concentrated chamomile tea drunk in large amounts can cause vomiting. What Are the Dangers of Chamomile Tea?